Raise your hand if you’re guilty of bringing home a new shirt or pair of pants from the store and wearing them, sans washing. It’s very common, maybe even typical, as many fabrics look pristine when they’re fresh off the rack. You probably assume they’re clean or at least relatively so, but tests conducted by Philip Tierno, Ph.D. director of Microbiology and Immunology at New York University, at the behest of Good Morning America, uncovered some disturbing compounds lurking on clothing. And this is only one reason to consider washing before wearing. Many clothing items are also contaminated with chemicals and dyes that may lead to irritation or other health issues. Even insects (like lice) could potentially be transmitted on new clothes. If you’re currently not a washer-before-wearing type, you may change your mind by the end of this article. What types of illnesses could you potentially get from trying on contaminated clothes? Organisms that cause hepatitis A, traveler’s diarrhea, MRSA, salmonella, norovirus, yeast infections and streptococcus are all fair game when it comes to clothing items tried on by multiple people. Depending on what country your new clothes were manufactured in, they may contain multiple chemicals of concern. Among them are azo-aniline dyes, which may cause skin reactions ranging from mild to severe. If you’re sensitive, such dyes may leave your skin red, itchy and dry, especially where the fabric rubs on your skin, such as at your waist, neck, armpits and thighs. The irritants can be mostly washed out, but it might take multiple washings to do so. Nonylphenol ethoxylate (NPE), meanwhile, is a toxic endocrine-disrupting surfactant used to manufacture clothing. 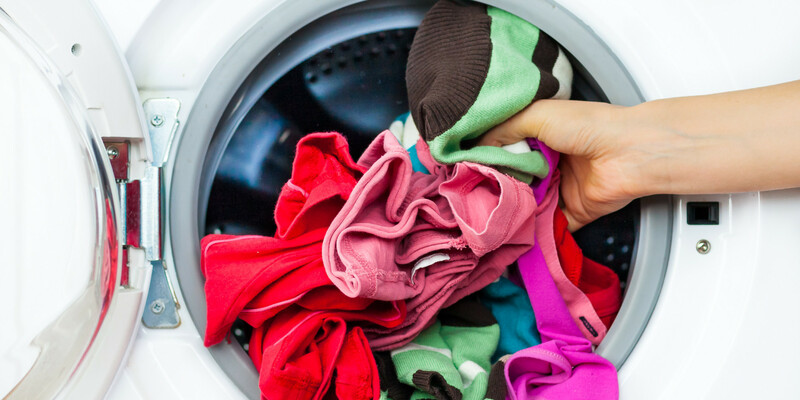 You certainly don’t want to be exposed to NPE if you can help it, but when consumers wash their clothes, NPEs are released into local water supplies where wastewater treatment plants are unable to remove them. When NPEs enter the environment, they break down into nonylphenol (NP), a toxic, endocrine-disrupting chemical that accumulates in sediments and builds up in fish and wildlife. Unfortunately, washing won’t remove all the chemicals in your clothing. For instance, the antimicrobial triclosan is sometimes added to fabrics, including clothing. Research has shown that triclosan can alter hormone regulation and may interfere with fetal development. Stain-proof clothing, meanwhile, is a common source of perfluorinated compounds (PFCs), which are toxic to humans and the environment. You’ll most often hear about PFCs in relation to non-stick cookware, but they’re also common in fabrics. “The chemicals used in cotton production don’t end with cultivation. As an aid in harvesting, herbicides are used to defoliate the plants, making picking easier. Producing a textile from the plants involves more chemicals in the process of bleaching, sizing, dying, straightening, shrink reduction, stain and odor resistance, fireproofing, mothproofing, and static- and wrinkle-reduction. Some of these chemicals are applied with heat, thus bonding them to the cotton fibers. Several washings are done throughout the process, but some of the softeners and detergents leave a residue that will not totally be removed from the final product. Chemicals often used for finishing include formaldehyde, caustic soda, sulfuric acid, bromines, urea resins, sulfonamides, halogens, and bromines. Some imported clothes are now impregnated with long-lasting disinfectants which are very hard to remove, and whose smell gives them away. These and the other chemical residues affect people with Multiple Chemical Sensitivities. As you might suspect, this is hazardous on multiple levels — for the farmers working with these chemicals, the people living nearby, the consumers buying the cotton and virtually everyone else, who will eventually be impacted by this widespread environmental pollution. This is one reason why I strongly encourage you to choose organic cotton clothing whenever possible — it will not be genetically engineered and subject to this onslaught of toxic exposures. Finally, many experts do recommend washing new clothes when you bring them home from the store, maybe even twice. If the article of clothing cannot be machine washed, consider running it through a cycle in a hot dryer before wearing it. You may also want to keep on some clothes while trying on new clothing at a store (at least leave on your undergarments, and then wash those too when you get home). Washing your hands after shopping is also a good idea, as you’ve been handling clothing that could have any number of chemicals and other contaminants on them.